Help! I have too much ——-!!! If you are so lucky, there comes a point in the farming season, where you are overrun with one type of produce, or many! 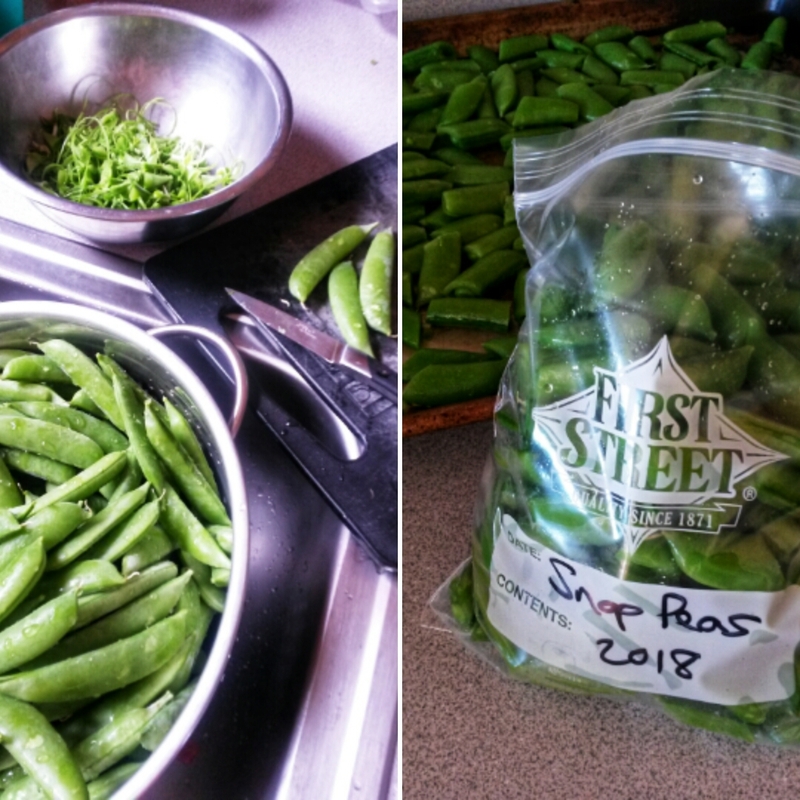 Recently it was snap peas that needed to go into the freezer. So I turned on the oven and got to work. Wait. The OVEN?!? You bet! We’ve found that a blast of heat – 475 for 5 minutes – does the same job as blanching, and the results are so much better! Traditionally, vegetables destined for the freezer are blanched (dropped for a minute or two in boiling water) transferred to an ice bath and then the freezer. This is to kill bacteria on the outside that could lead to spoilage. Only thing is, the veggies are so waterlogged by the process that they have no snap left once you dig them out of the freezer to eat them. Yuck. The oven blasted veggies, by comparison are still crisp when thawed. And it works for most any vegetable! Prep your veggies, toss with a little olive oil, spread one layer thick on your cookie sheets, and bake at 475 for 5 minutes. Let cool to room temp, throw them in freezer bags (marked so you don’t grab peas when you wanted beans! ), and put them in your freezer. It really is that simple! Although you wouldn’t know it, at this exact moment in time, it’s almost summer. A season where we eat as much raw food as possible, simply so we don’t have to heat the house. Chief among our strategies is an entree so beloved, so enjoyed, that it is simply known as “The Salad.” Packed with fresh produce, garnished with cold noodles, protein and heavily dusted with finely chopped herbs, this dinner entree is a powerhouse of nutrition and extraordinarily satisfying. We eat it at least once a week. 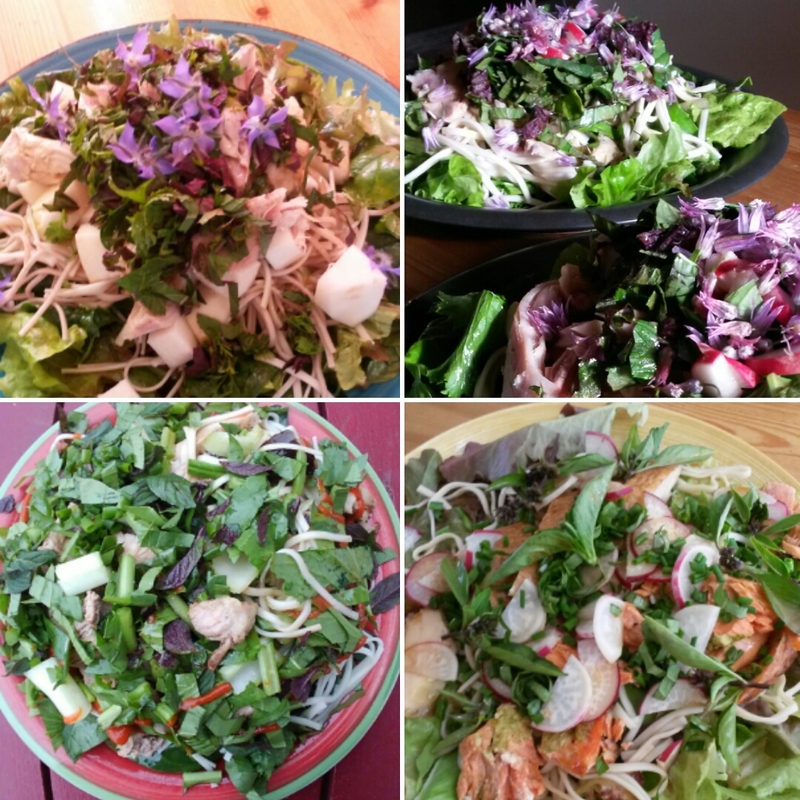 Gather a bunch of salad greens: lettuces, spinach, turnip and radish greens, arugula, etc. Tear a healthy amount and toss with a few Tbsps of the dressing. Make a base of the salad on your plate. Top with a handful of cooked soba noodles. Garnish with cooked chicken, pork, steak or vegan protein (leftovers from weekend grilling!). Top with chopped radish, turnip, snap peas, asparagus, or crunchy goodness of your choice. Dust with a healthy amount of chopped herbs: chives, basil, mint, cilantro, etc. Chopped nuts or seeds are welcome. Chive or borage flowers a decorative plus. Spoon more dressing on top. Take a picture. Eat. I like fish sauce as a condiment – the farmer likes sambal oelek. Make it your own! Enjoy! 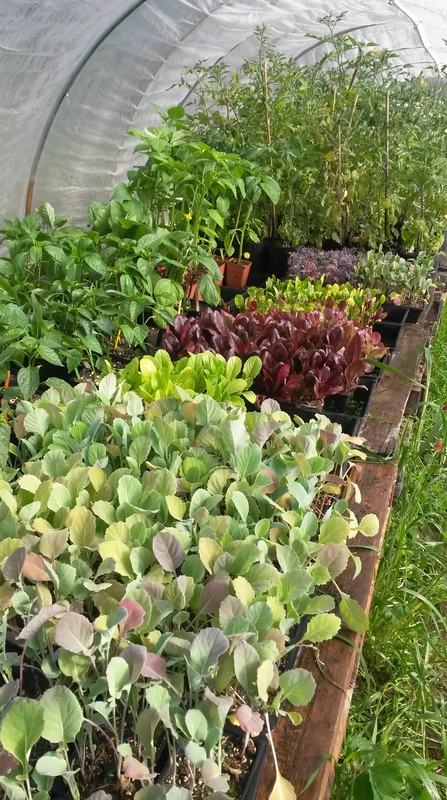 FINAL Weekend for Plant Sale! $5 for tomato plants and $3 for tomatillos, eggplant, hot and sweet peppers, summer squash, zucchini, cucumbers, assorted greens and brassicas. We also have eggs! Saturday and Sunday, 9am-3pm, 928 Wilson St. NE. Follow the signs. Have a great weekend – and call your Mother! Plant sale 9am-3pm, Saturday and Sunday. 928 Wilson St NE. Next weekend is our last, so if you’ve been thinking of stopping by, now’s the time! Lo cally grown veggie starts: Saturday and Sunday, 9am-3pm. 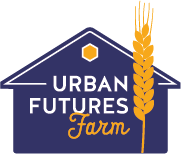 Urban Futures Farm, 928 Wilson St NE. Cash or check, please. And in gallons, our farm specialty | $7 – 14 (fourteen!) varieties of tomatoes. Have you noticed how wet and chilly it’s been? Well, the baby plants have noticed, and are taking their sweet time growing because of it. So we’ve bumped veggie start sales to next week, April 21 (Earth Day weekend!) – Saturdays and Sundays, 9am-3pm. Here’s what we’ll have in 6-packs next week: Salad greens mix, Lettuce, Spinach, Kale, Broccoli, Bok choy, Napa cabbage, Cabbage, Cauliflower, Swiss chard and Collard greens. In 4″ pots: Hot peppers, Sweet peppers and Eggplant. And in gallons, our farm specialty: 14 (fourteen!) varieties of tomatoes. 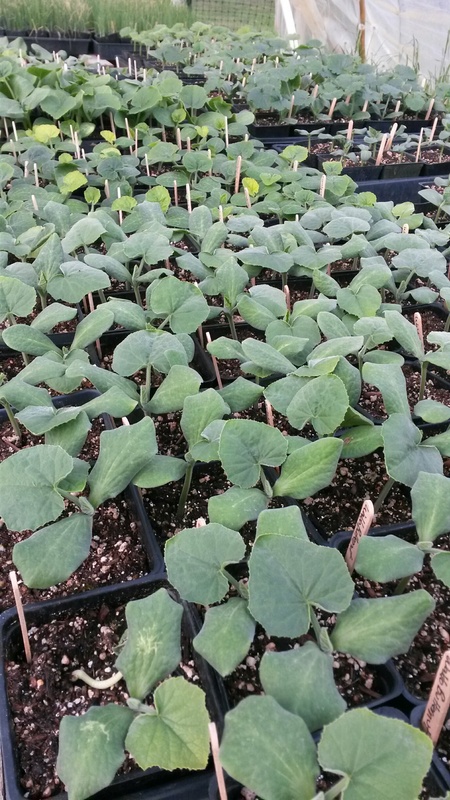 Come May, we’ll offer Basil, Cilantro, Zucchini, Summer & Winter Squash and Cucumbers. If at all possible, I try to avoid investing in a product that can only do one thing. Hence, I have no ice cream maker. I do however, have a Vitamix, and while this is not a product placement ad, the following recipe needs a blender with a bit of power because – and here’s the cool revelation – you can use your powerful blender to make ice cream! Or ice milk, or buttermilk ice – we haven’t really come up with a name for it. 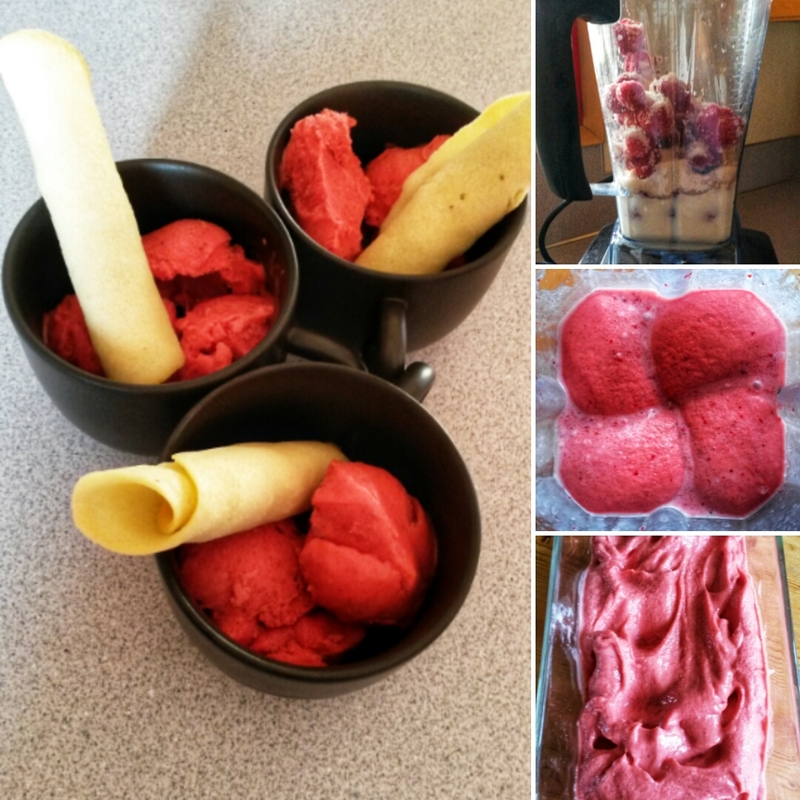 But it takes only three ingredients: 3 cups frozen fruit, 1 cup buttermilk, and 1/3 cup sugar. The original recipe called for peaches, which sounds divine. But we don’t have a lot of peaches in the PNW. What I do have in my freezer are lots and lots of berries. So I substituted strawberries. Yum! The buttermilk makes for a great mouth-feel, and the fresh strawberry flavor just leaps out. And so simple! Blend it up, scrape into a container (my pyrex bread pan lends a gelato look, no? ), and freeze for a couple of hours. The nice thing about this recipe is that you can refreeze what you don’t consume right away and the texture doesn’t suffer. Other similar recipes I’ve tried have ended up a block of ice once fully frozen. This time, I added some fresh thyme from the garden – just because, you know, why not be creative? A great resource is Erica Strauss’s blog NW Edible Life, and even though we don’t make much jam, I find her jam flavor chart to be super-helpful for a myriad of other things, from baking to popsicles.